After many years of campaigning in the CAMS Victorian Off-Road Championship, Sibson Racing #412 led by Peter and directed by partner Dee, entered 2017 for a new challenge, destined to compete at tracks never experienced in the ARB Off Road Racing Series. A veteran of the class 4 scene for over 15 years since debuting in a buggy in 1981, Sibson’s greatest accolade to date was claiming the 2010 Victorian Off Road Championship in his beloved 1965 Beetle. As the first round was fast approaching, Sibson was eager to unleash his 2002 Bennett Truck, fitted out with a 6 litre LS2 Chevrolet V8, Turbo 400 transmission and Fox shockers all round into the ARB season. The team’s goals were straightforward leading into the opening round at Stackpoole; to get to the finish in as many races as possible, whilst ensuring all made it safely through to the Sibson wedding, which ultimately capped off an amazing 2017. 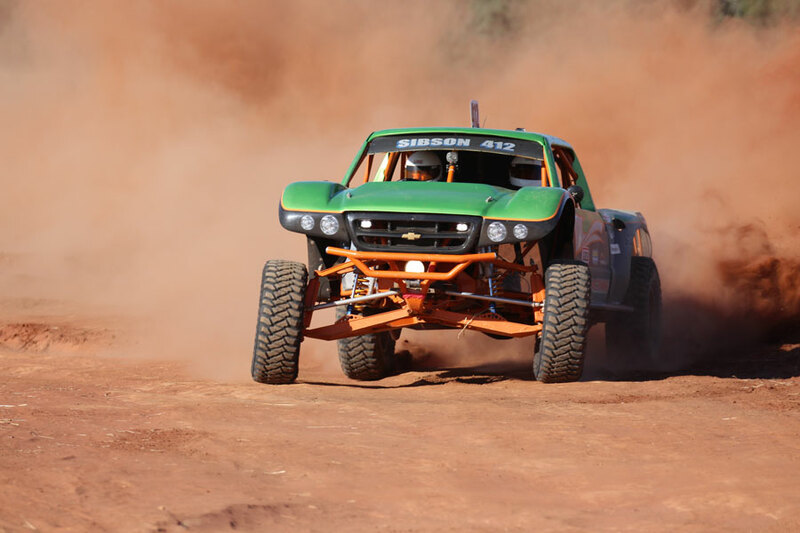 Sibson Racing #412 began their ARB Australian Off Road Racing Series class 4 title assault at the ARB Town and Country Tyres Stackpoole 400 in March; a solid run in the prologue positioned them third in class in their Griffith debut. Unfortunately for Sibson, after an impressive opening three laps he was forced to retire from the race with an oil leak, though still managed a third placing. It was onwards and upwards for the team who rolled into Mildura for the ARB Sunraysia 400 in mid-April; unluckily a broken flex plate early on lap one bringing their second round to a sudden halt. Major engine failure at the local Avalon club day forced Sibson to install a standard second hand 6L engine before the second half of the season; a move which reaped immediate reward. A quality field of class 4’s assembled at the Haeusler’s Mallee Rally ARB 400 over the June Long Weekend; the perfect location for Sibson to reinvigorate his 2017. Kick-starting their Sea Lake assault prologuing second in class, Sibson continued his front running position over the four 100km laps of the fast Mallee terrain to claim the team’s maiden ARB class 4 win, and 15th outright. Fresh from a breakthrough performance, Sibson Racing joined a star studded line up at the Waikerie Hotel ARB Riverland Enduro in late July, for the fourth round of the sereis. Subsequent to prologuing fifth in class, Sibson boosted his title hopes with a consistent display, completing the dustless four 75km laps third in class and 15th outright behind the Geiser Bros Trophy Trucks of Gartner and Haby. 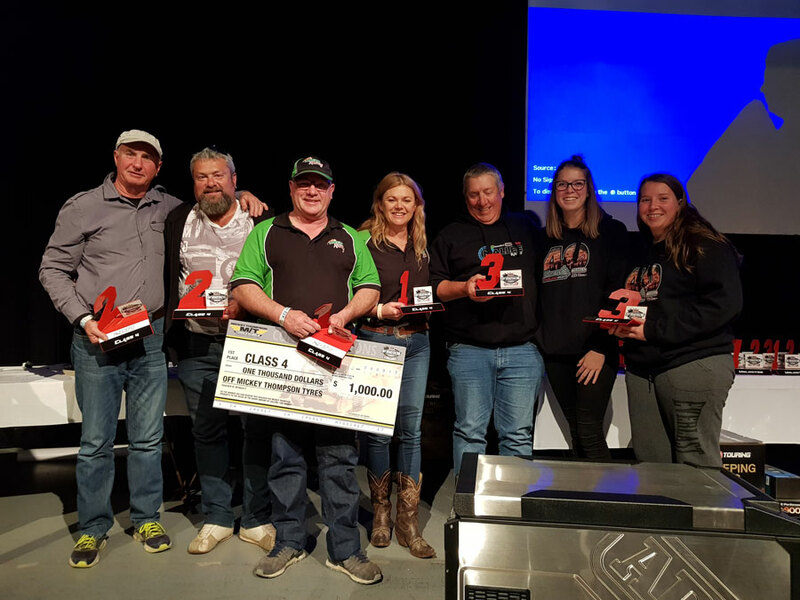 A drawcard to the ARB series was to compete at tracks that took Sibson and crew out of their comfort zone from local races; the week round trip to the Albins ARB Goondiwindi 400 was certainly a highlight. The enormity of the melon hole challenge that awaited was unlike anything that the crew had experienced previously, with outright trucks amongst the class 4 field it was to be Sibson’s greatest challenge of 2017. 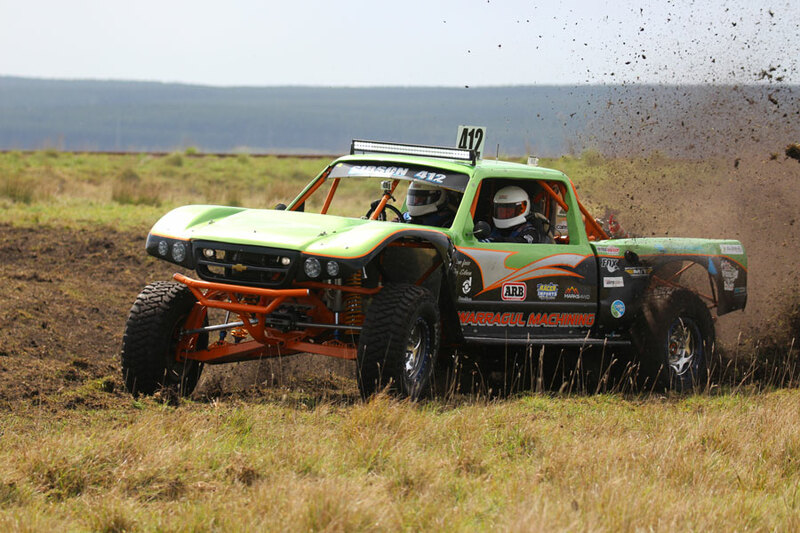 A creditable fourth placing in the much anticipated prologue was backed up during Saturday’s opening 80km lap, with Sibson and Farr bringing home the Bennett Truck sixth in the class 4 standings. An enduring, tough, dusty, four laps were completed on Sunday by Sibson in another spirited effort, third in class and 16th outright the reward and in doing so placing them in the driver’s seat for ARB silverware. A season of highs and lows for Sibson Racing came to a conclusion at the Teagle Excavations ARB Pines Enduro 400. The unfortunate engine issues that arose early in the season, were entirely outweighed by the latter results, new friends made and the support and camaraderie amongst the ARB fraternity. Sibson got proceedings underway at a damp and cold Millicent, prologuing fourth in class 4, which was consolidated perfectly in Saturday’s short course action with a second place finish. 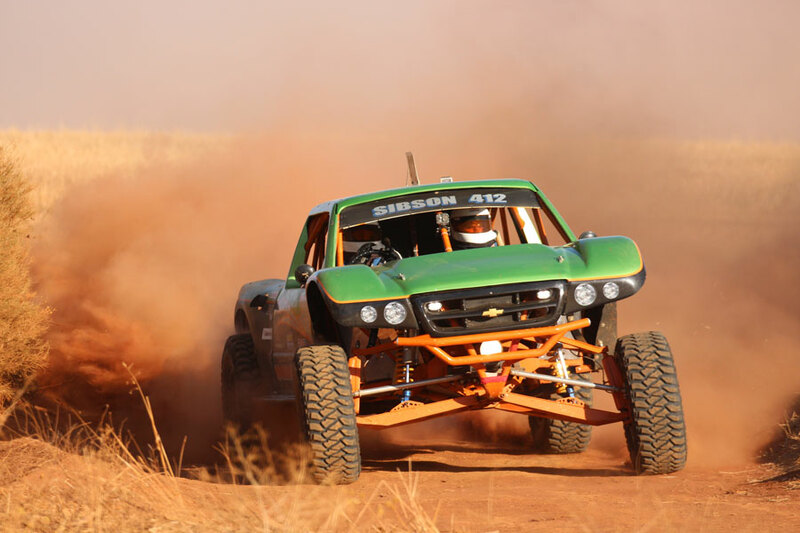 Sunday’s action would determine if Sibson would take home the ARB Australian Off Road Racing Series Class 4 silverware after a season long battle with John Smith #445, and with six gruelling 74kms ahead of them it was game on! Sibson thrived in the sandy conditions, overcoming the hustle of the opening laps following a reverse grid start to complete the Pines Enduro in a touch over 5 and a half hours. In doing so, Sibson recorded a terrific 12th outright and class victory, enough to secure a maiden ARB Off Road Racing Series class 4 title and sixth outright, along with the class 4 title in the inaugural Element Off Road AORRA South Australian Championship, an outstanding reward for their persistent approach. With a successful racing season in the bag, Peter and partner Dee’s 2017 reached a climax in early December when they became Mr and Mrs Sibson; the perfect ending to a memorable year on a glorious day amongst family and friends. Sibson has already announced his immediate intentions to try and defend his ARB401 plate in 2018, and if the form line continues the Bennett Truck #412 will be well in the mix. Sibson Racing could not have achieved their magnificent results without the support of all sponsors, including Mickey Thompson Tyres, Donaldson Filtration Systems, C&L Transmissions, Powerhouse Engines and the staff of Warragul Machining & Mechanical Repairs, the backbone of an unforgettable 2017!